Posted May 19, 2017 & filed under Hydrology. 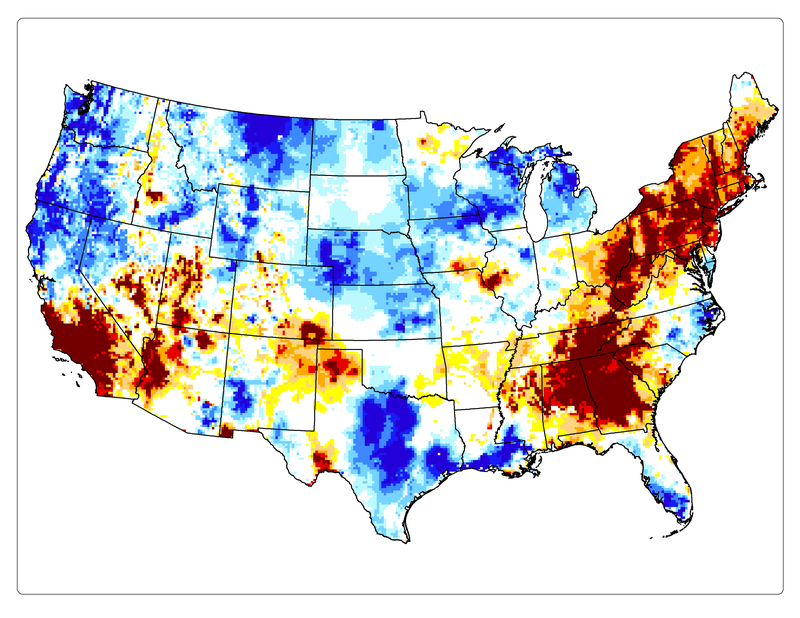 This colorful map, developed by the National Aeronautics and Space Administration, provides an important view of the extent and level of drought and wetness in shallow aquifers across the United States. These regional conditions vary seasonally and in response to changing weather and climate, and are an important context for local changes to shallow groundwater. The value of local time-series data collected by networks of Wellntel systems is increased by the the understanding of regional and historical variations as presented by this map. The map presents in white, areas of shallow groundwater that are currently (map date) experiencing near average conditions of drought/wetness. 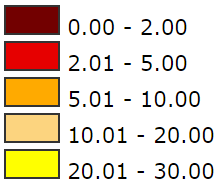 Specifically, the white areas are within 20% of the mean of the historical drought/wetness range – meaning percentiles ranging from 30% to 70% of the range. Areas of warm colors on the map indicate that drought conditions (low wetness) currently exist relative to the historical range and mean. For instance, areas of the US covered by the orange color are experiencing shallow groundwater conditions that are drier than 90% of the historical record. The areas covered by the brown color are currently experiencing low wetness that is more extreme and rare, having been experienced only about 2% of time during the 62 year historical period. Areas of cool colors on the map indicate that higher wetness conditions currently exist relative to the historical range and mean. 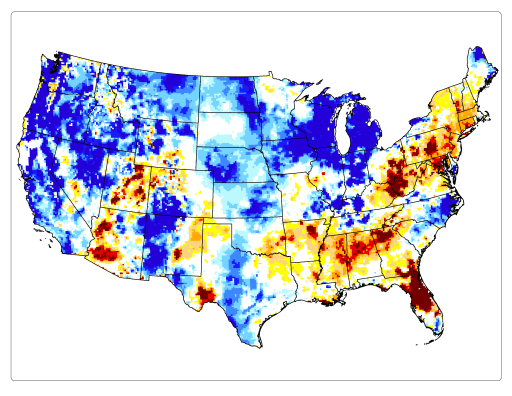 For instance, areas of the US covered by the lightest blue color are experiencing shallow groundwater conditions that are wetter than 70% of the historical record. The areas covered by the darkest blue color are currently experiencing wetness that is more extreme and rare, having been experienced only about 2% of time during the 62 year historical period. Regional and historic data such as illustrated by these GRACE-based maps provide an invaluable context for assessing and implementing local water-management choices. The GRACE-based maps present data at the scale of 1/8 of a degree, and the maps are expected to be “reasonably well correlated with measured water table variations over spatial scales of 25 km (16 miles) or more“. A community-based groundwater network will provide stakeholders with information at a much greater resolution, limited only by the spatial density of available wells. The following hydrograph of data collected by a Wellntel system shows the changes experienced in the Central Coast of California, near Paso Robles. 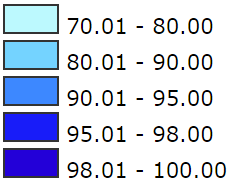 In this single-well example, the Wellntel data show the local manifestation of the regional changes presented by the GRACE maps. Specifically, the hydrograph shows the transition from drought conditions in the Paso Robles area presented by the November 21, 2016 map (below), to the wetter conditions of the February 13, 2017 map (top). The hydrograph shows a rise in water level of about 45 feet over this period. A network of wells providing temporal data with this density, would be exceptionally useful in addressing important local water management challenges. Sponsoring a network of Wellntel systems deployed on a mix of monitoring stations and volunteer wells will provide local time-series data that are critical for broadly visualizing and managing your groundwater resource, and making local sense of regional trends. Let Wellntel work with you to create a network of private and public wells to deliver high-density data via the web at a cost substantially less than previous technology and approaches. The most important outcome of a sponsored network may be engaging the primary stakeholders – well owners and the community – to become their own best advocates to understand, manage, and protect their shared resource.